If It's Too Loud...: Win tickets to the Nines Festival! 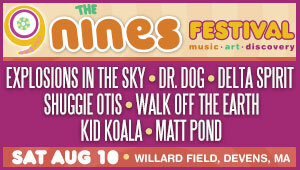 Win tickets to the Nines Festival! Ok.. fine. It's not through us. But we want to make sure you know about a couple of contests to win free tickets to the Nines Festival, happening at Willard Field in Devens, MA on August 10. The inaugural event features Explosions In the Sky, Dr. Dog, Delta Spirit, Shuggie Otis, Walk Off the Earth, Kid Koala, and Matt Pond with more to be announced. There's also a comedy tent curated by Rick Jenkins of The Comedy Studio featuring Erin Judge, Ken Reid, and Jenny Zigrino with more to be announced. You can enter for tickets through Relix here and CMJ here. Hurry, because the CMJ contest ends tomorrow, June 27! And, of course, check out the Nines Festival website for more info. Good or Evil Alert: Pink Floyd to Spotify? 2 Acts Added to the Nines Festival!